Working out where one hare ends and another begins is easy; a siphonophore, not so much. What is an individual in nature? is a biologist and philosopher of science. He is currently a lecturer in philosophy at the University of Pennsylvania. His work has been published in Philosophy of Science and Trends in Ecology and Evolution, among others. When she was two years old, I took my daughter to the American Museum of Natural History for the first time. As we strolled through the displays of taxidermy animals, she would waddle towards each one, and point and ask what we were looking at. When we entered the Hall of African Mammals, she was so overwhelmed by the presence of her storybook companions that she could only manage to jump up and down on the spot while shouting a mishmash of half-formed names. Leophant! Zeepotamus! Seeing her favourite animals was the highlight of her day, but mine was reliving the excitement of discovering strange new beings, as my daughter asked, wide-eyed, over and over again: what’s that? Most of the time the living world appears to us as manageable chunks. Even a toddler can see that. We know if we have one dog or two; at a pinch, we can probably count how many trees are growing in our backyard. Natural history museums started, in part, as embodiments of early scientific approaches to ordering and cataloguing the diversity of life. This is possible only because humans can usually intuitively pick out one organism from the next – that is, because most of the creatures we come across have pretty clear boundaries in space and time. When my daughter and I stood back and considered a herd of frozen elephants walking in a line at the museum, it was clear – even for a baby with its trunk wrapped tenderly around its mother’s – where one elephant ended and another began. How come, then, the meaning of individuality is one of the oldest and most vexing problems in biology? For millennia, naturalists and philosophers have struggled to define the most fundamental units of living systems and to delimit the precise boundaries of the organisms that inhabit our planet. This difficulty is partly a product of the search for a singular theory that can be used to carve up all of the living world at its joints. But my view is that no such unified theory exists; there’s no single answer to the question: ‘What parts of the world are a part of you as a biological individual, and what parts are not?’ Different accounts of individuality pick out different boundaries, like an overlapping Venn diagram drawn on top of a network of biotic interactions. This isn’t because of uncertainty or a lack of information; rather, the living world just exists in such a way that we need more than one account of individuality to understand it. 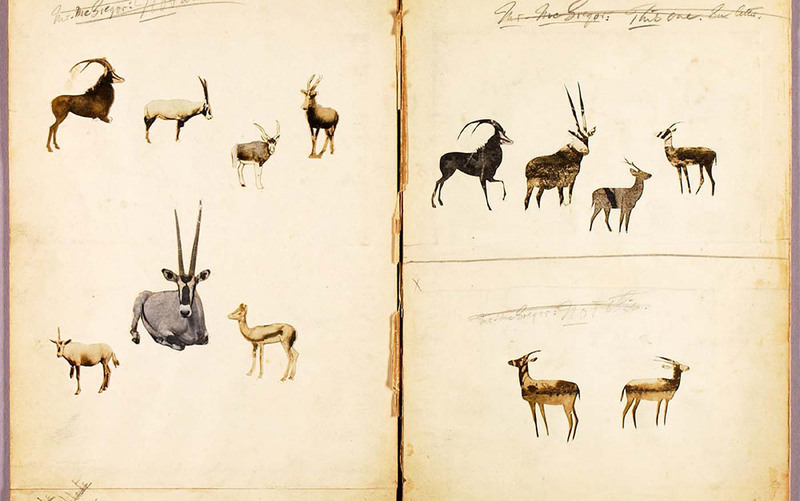 Antelopes, study folder for Concealing Coloration in the Animal Kingdom by Abbott Handerson Thayer. Courtesy the Smithsonian American Art Museum. When you stop to think about it, the problem of individuality is (ironically enough) actually composed of two problems: identity and individuation. The problem of identity asks: ‘What does it mean for a thing to remain the same thing if it changes over time?’ or ‘What makes two entities the same kind of thing?’ The problem of individuation asks: ‘How do we tell things apart?’ or ‘What are the boundaries of an object?’ Identity is fundamentally about the nature of sameness and continuity; individuation is about differences and breaks. These two issues are different sides of the same coin. You can often reframe one in terms of the other to suit your focus. To pick something out in the world you need to know both what makes it one thing, and also what makes it different than other things – identity and individuation, sameness and difference. Each of these aspects of individuality also tends to come in degrees. A bee is better individuated than a swarm; and a swarm is better individuated than an ecosystem. Similarly, you are closer to the person you were yesterday than you are to the one in your baby photos. Such abstractions connect to more practical questions. Imagine you’re trying to catalogue the species of invertebrates in your garden. You’d want to lump the juveniles and adults together as members of the same species even if they looked different. To do this you’d need to understand the different stages of an organism’s lifecycle, so as to avoid errors regarding identity. Admittedly, this might make it quite difficult to get an accurate species count in a garden swarming with butterflies and caterpillars. Likewise, you’d need to be careful not to individuate the wrong way, counting parts of one organism as separate entities rather than a single thing. If you spy a slug and a snail, you’d need to take note of two kinds of living things. You wouldn’t want to count one slug, and then a second slug with a third thing – a growing shell – hitching a ride on its back. But with enough knowledge at your fingertips about the lives of invertebrates, a good enough taxonomy should be possible – right? That’s more or less true for animals, but you don’t have to leave your garden to find fuzzier cases: plants. What individuates one organism from another? Plant life is tricky here because it can be hard to tell when a plant is growing and when it’s making something new. The philosopher of biology Peter Godfrey-Smith at the University of Sydney diagnoses the distinction between growth and reproduction as one of the central puzzles at the heart of biological individuality. As he puts it: ‘reproduction is making a new individual, while growth is making more of the same’. But there’s an uncertain relationship between the two. As well as sprouting from seeds, strawberries and many grasses send out above-ground horizontal stems called runners or stolons. New systems of roots and leaves will grow where these runners set down. If the runners get severed, the plants will carry on with no problems. A single strawberry seed can produce a large network of distinct ‘plants’, some connected and some disconnected from the others. It’s difficult to determine the boundaries of the plant that grew from the original seed, and consequently, how many total strawberry plants there are in the garden. In the early 19th century, plants were what really kickstarted the debates among naturalists about the definition of individuality. Erasmus Darwin, the grandfather of Charles Darwin, wrote in The Botanic Garden (1791): ‘A tree is properly speaking a family or swarm of buds, each bud being an individual plant.’ A special draw for the early naturalists building up their museum collections were the unusual organisms swept up during survey expeditions across the world. Strange colonial creatures with weird life cycles were being dredged up from the sea: encrusting colonies of sac-like tunicates that start life swimming around like tadpoles; long chains of transparent jet-propelled salps; and corals, anemones, sea pens and other animals that were initially believed to be plants. A young Charles Darwin served as the ship’s naturalist on one of these expeditionary voyages, collecting 5,000 specimens over the course of five years. In his journal – published as The Voyage of the Beagle (1839) – he wrote about his interest in the ‘compound animals’ of the sea, where ‘the individuality of each is not yet completed’. Take corals, made up of colonies or clusters of thousands upon thousands of connected clones called polyps. ‘What can be more remarkable [than] to see a plant-like body producing an egg, capable of swimming about and of choosing a proper place to adhere to, which then sprouts into branches, each crowded with innumerable distinct animals, often of complicated organisations,’ Darwin said. He compared the individual units of such ‘zoophytes’ to buds on a tree; but he, like his grandfather, accepted that the buds ‘must be considered individual plants’. The English biologist Thomas Henry Huxley – who would later gain renown as ‘Darwin’s Bulldog’ – presented an influential account of individuation in his address to the Royal Institution of London in 1852. 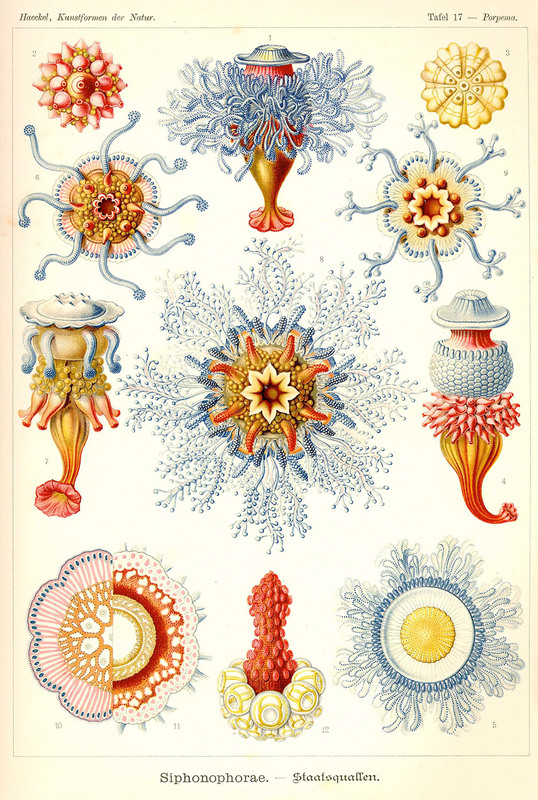 Huxley studied a group of jellyfish-like marine invertebrates called hydrozoans. Some hydrozoans (the hydra) live their lives as individual polyps, while others (siphonophores, such as the Portuguese man-of-war) develop into complex colonies made up of many individuals. Huxley dubbed these latter creatures zooids. Huxley’s problem was to figure out how to pick out ‘a single thing of a given kind’ for comparative purposes. Is an individual hydra polyp analogous to an entire siphonophore colony – or is it more like a member of that colony? To begin with, biological individuality couldn’t rest merely on independent existence, Huxley said. As in the case of single zooids or our disconnected strawberries, treating individuality as the capacity to self-sustain would ‘inevitably lead to absurdities and contradictions’. Instead, Huxley singled out sexual reproduction – the generation of a new organism through the fusion of sperm and egg – as the pertinent criterion. Asexual ‘reproduction’ through cloning and budding, like the expanding stolon network that emerges from a single strawberry seed, is only growth. True biological individuality, he said, ‘is the sum of the phenomena presented by a single life: in other words, it is all those animal forms which proceed from a single egg, taken together’. A hydra polyp that reproduces via sexual reproduction is therefore analogous to a siphonophore colony, not an individual zooid. A page detail from Ernst Haekel’s Kunstformen der Natur. Courtesy Wikipedia. For Huxley and Janzen, sexual reproduction draws a clear line in the sand between growing larger and producing new. It leaves us in a strange situation, though – not just with regards to plants and invertebrates, but also concerning the vast majority of unicellular life, including almost all bacteria. These organisms tend to reproduce by asexual division, dividing in half to produce two clones. So the two bacteria left behind would have to be considered as parts of a larger whole; and, failing mutation and sub-population differentiation, an entire population of bacteria would be considered a single individual. That seems pretty unsatisfactory. So what’s the alternative? Recall that individuality has two sides. We’ve been looking at the criteria for what individuates organisms – an area where sexual reproduction seems particularly helpful. But we might also look at it from the other direction, to discern what endows all parts of a thing with a coherent identity. That is, what makes a living system a specific individual, something that can undergo change but somehow remain the same? One answer is to see individuality as a spectrum or gradient. But can something be more or less ‘distinctly itself’? That’s very counterintuitive – not least because the notion of the individual has long been tied to the idea of essences, the irreducible ‘natures’ of things that lie in a realm somewhere beyond the shifting world of matter. Long before Darwin set foot on the Beagle, Aristotle explained the natural world in terms of ‘primary substances’ – his name for individuals qua individuals, the most basic forms of existence. A single, specific acorn is a primary substance, from which you can then build more general categories such as acorns or seeds. Aristotle went on to analyse why something is the way it is in terms of four causes, with the final cause or telos (meaning ‘end’ in Ancient Greek) being the ultimate reason or purpose for its existence. A thing’s telos is its essential nature. Acorns are meant to become oak trees, just as knives are meant to cut. The forces that animate the acorn lie within it, and work so as to achieve this ultimate goal. This teleology goes all the way down. Why does the acorn fall from the tree? Because, being made mostly of the elements of earth and water, it wants to find its natural place, which is as close to the centre of the Earth as possible. For nearly two millennia, Aristotle’s theory of final causes dominated how European scholars thought about the living world. But such notions were eventually displaced by the philosophies that emerged during the scientific revolution of the 16th and 17th centuries. Instead of the telos, science focused on the interaction of matter in motion in accordance with universal laws. On this view, organisms are not defined by some abstract, transcendent purpose; their distinct quality must come from what can be observed down here on Earth. Acorns become oak trees due to the unfolding interactions of their underlying matter. Tacking on something about the nature or purpose of an acorn adds nothing to this explanation. One of my favourite figures working through this period of intellectual upheaval was Sir Kenelm Digby – an extraordinary but now obscure 17th-century English natural philosopher, alchemist, privateer and courtier, who was also a celebrated swordsman, a famous brewer, and the inventor of the modern wine bottle. Digby was at the forefront of biological thinking, especially in organismal development. He obsessed over how natural systems are organised and develop – starting with simple cases and moving up in complexity towards humans. In Two Treatises (1644), his most well-known philosophical work, Digby attempted to wed the emerging mechanical philosophy with Aristotle’s idea that individuals are something more than just the collection of their parts. But, in accordance with a scientific paradigm, this ‘something more’ shouldn’t come from the realm of the non-material or occult. Digby thought of animals as intricate automata, and like a machine, the behaviour of an animal could be caused only by the underlying order and actions of its parts. But what is it that unites the parts of a system into a living individual? To solve the problem, Digby developed a theory of how compound entities are organised. Animals and machines have an internal division of labour, he said: the parts have ‘very different natures and kinds of motion’ such that ‘one might conceive they were every one of them a complete different total thing by itself’. Living things are made up of parts that perform distinct functions; bones support, hearts pump, hands grasp and manipulate. But there must be something that turns a system into an independent and genuine whole, rather than just a set of parts ‘artificially tied together’. Digby’s answer was to say that the wholeness comes from the system being functionally interdependent and integrated. That is, the activities in one part of the system are brought about by a cause external to the part where it occurs (interdependence); and the mutual workings of the parts account for the behaviour of the system as a whole, making this activity internal to the entire system (integration). An elephant’s heart, for example, pumps blood only because it’s supplied with energy from the digestive system, oxygen from the respiratory system, and support from the skeletal system. All those bits working in tandem is what makes it possible for an elephant to walk around doing elephant things. By contrast, a haphazard pile of elephant parts is not the same thing as an elephant. In fact, all those parts would be dead. So the functioning or existence of each part depends on the functioning or existence of the other parts, and you get the characteristic behaviour of the individual only when all the parts are organised and working together as a whole. 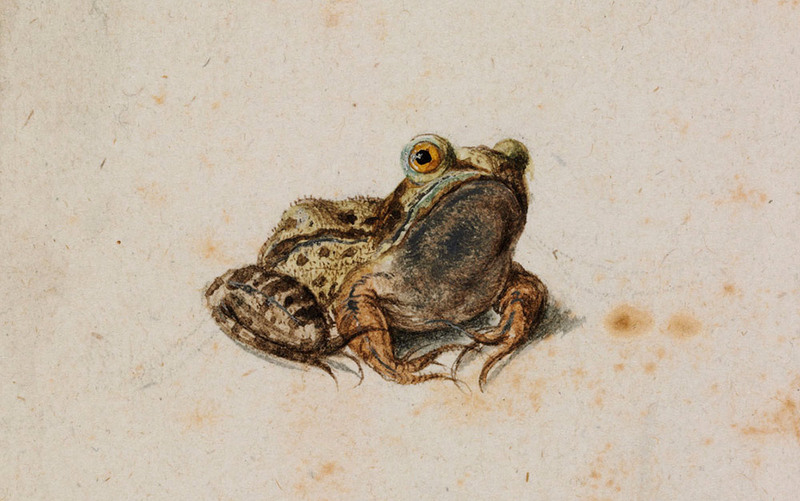 A Bullfrog by Hans Hoffmann c.1580. Courtesy Budapest Museum of Fine Arts. Cell theory added another dimension to the debate: hierarchy. The traditional view was that you can carve up living systems in only one way. If you find individuals, then any smaller units are parts, and any larger units are groups, communities or colonies. This was the position of Digby and T H Huxley. But from a hierarchical perspective, individuals can be made up of other individuals. For example, in his 1855 survey of ‘the vegetable individual’, the botanist Alexander Braun described speculations that flora are made up of tiny, lively, independent granules that ‘inhabit the secret halls of the bark-palaces we call plants, and here silently hold their dances and celebrate their orgies’. Enter Julian Huxley, a biologist, grandson of Thomas, and brother of Aldous, author of Brave New World (1931). Huxley developed a more rigorous theory of biological hierarchy. Living matter could be grouped into continuing, ‘closed, independent systems with harmonious parts’, he wrote in The Individual in the Animal Kingdom (1912). This position differed from his grandfather’s in that it included organisms that reproduced asexually, sub-organismal individuals such as cells, and discontinuous individuals such as ant colonies. Crucially, Huxley also endorsed gradients of individuality. In real systems, he wrote, ‘closure is never complete, the independence never absolute, the harmony never perfect’. This was of real interest when it came to understanding the evolution of multicellular organisms, such as ourselves. Evolution teaches us that no organism was ever cut from whole cloth or brought into being out of nowhere. At some point in history, independent cells must have changed so as to be able to stick together and then evolve as a collective. This was what Huxley called ‘the movement of individuality’ – the transformation of individuals into a new higher-level individual. You could also see this as the continuous emergence of new part-whole hierarchies. Collectively, such changes are now known as major transitions or evolutionary transitions in individuality. They include genes coming together as chromosomes; an archaeon (a bacteria-like organism) engulfing a bacterium to become eukaryotes (the bacterium eventually became our mitochondria); the origins of multicellularity; and the origins of social groups that act as cohesive individuals (such as insect colonies). So what? Does it matter if there’s no grand theory of biological individualism? There’s one way in which it surely does. To construct explanations, population biologists and ecologists must be able to discern individuals in a population. Evolutionary biologists must be able to tell parents apart from their offspring, and one lineage from another. Immunologists and developmental biologists must be able to distinguish between an individual and its environment. In other words, biologists must be able to count things, and then compare those counts. But maybe there’s simply no way of picking out the true nature of biological individuals. Instead, there might just be lots of different ways of carving up biological systems, lots of different kinds of individuals, each relevant for a different purpose. It’s a patchwork. Many biologists and philosophers take that stance. One of the things that Janzen pointed out in ‘What Are Dandelions and Aphids?’ was that evolutionary biologists and ecologists are talking about different things when they talk about individual dandelions and individual aphids. Various parts of biology might settle on different objects worth describing. So perhaps a biological individual is just whatever it is that biologists happen to find useful to pluck out and examine. The American philosopher David Hull wasn’t satisfied with that response. He claimed that the individuating practices of biology should be based on the best worked-out theories about life, not simple expedience. Hull followed the lead of Julian rather than T H Huxley – that is, while it’s clear and convenient to link individuality to sexual reproduction or spatial separation, there’s no underlying scientific theory that demands it. For Hull, the only biological theory sufficiently robust to account for individuation was the theory of evolution by natural selection. Evolution itself is meant to tell us which entities count as individuals. Because natural selection is the engine of evolution, Hull said, we need to account for individuality in terms of what is required for selection. At their most basic, evolutionary individuals are entities that vary among each other, their variability causes variations in fitness, and that variation and fitness is passed along to the next generation. These individuals are also often referred to as ‘units of selection’ because they are the unit upon which the process of natural selection operates. It is the selective pressure over evolutionary time that explains why organisms have functional cohesion, are well-fitted to their environment, go through reproductive bottlenecks and develop from unicellular eggs. These traits often correlate with being an individual, and can function as a handy marker – but they are not a reason to define something as an individual per se. Hull’s view has been hugely influential, almost to the point of dominance. I agree with Hull that biological individuality should be based on our best theories, and that evolution by natural selection is the best tool we’ve got. But the focus on evolutionary theory as the sole theoretical criterion of individuation is unfortunate. Not because it isn’t up to the job, but because it’s side-lined some of the rich historical approaches we’ve discussed here, such as functional integration – which now, funnily enough, have become relevant in new ways. The reason for the revival is that there’s a revolution brewing in how we understand the role of microorganisms in evolutionary history. Symbioses are collectives made up of different species, or unlike things living together. A familiar example are termites, who rely on the bacteria and protists in their gut to digest the cellulose that makes up their primary diet. This cohabitation is quite different to the corals, hydrozoans and ant colonies that fascinated the 19th-century naturalists; they were made up of the same species. (Though we now know that these colonial animals are symbiotic collectives as well.) We’ve long suspected that multicellular creatures, including us, have been entangled in symbiotic relationships with bacteria and other microorganisms throughout our evolutionary history. But until recently, details of symbiotic interactions were pretty shadowy and difficult to uncover. That all changed with the advent of DNA sequencing. Now scientists can simply extract bacterial DNA, and start to figure out what bacteria are there, and what they are doing. It turns out that many symbiotic interactions appear to run very deep indeed. Let’s return to aphids, the bane of greenhouses and gardeners everywhere, the companion to Janzen’s dandelions. These insects have another interesting feature, beyond the way they shift between asexual and sexual reproduction. They are specialists that feed exclusively on the sap of plants. This presents a problem for the aphid because plant sap is devoid of some of the essential amino acids that they need to survive. Where once they would have had to forage elsewhere, they now get a substitute through a special partnership with bacteria (such as Buchnera aphidicola) that live inside their cells. The bacteria synthesise the amino acids that the aphid needs. But by now this symbiosis is at least 160 million years old, and both partners have lost the ability to survive without the other. In the case of Buchnera, they lost most of their genome. Sometimes evolution can lead to simplification as well as complexification in the ‘movement of individuality’. The bacteria are now so well-integrated with the aphids that they are passed down from mother to offspring through inclusion in the egg. Most symbiotic associations aren’t bound up so tightly. But they’re still almost everywhere we look. Like all other large mammals, humans carry around a massive and diverse community of symbiotic microbes, collectively called the microbiome. These microbes, mostly bacteria, cover nearly every surface of the body. They’re teeming on your skin, on your teeth and in your airways. But the majority of them, by far, reside in your gut. The most recent estimate puts the number of microbes living in and on you as equal to the number of cells in your body (the paper that made this estimate notes that the ratio is so close that pooping can swing the balance). Many of the microbes that live with you are probably doing it passively. You are just another environment for them and they don’t have much effect on you. But some of them have been functionally and physically integrated with your body. It turns out your microbiome has an extraordinary and sometimes disturbing range of effects. It can make some otherwise unavailable nutrients available to you, and so have an impact on your metabolism and your weight. It influences the development of your tissues and your immune system. It can help defend you against pathogens. It might even have consequences for your behaviour and mood. Unlike in the aphids, where offspring get their symbionts from their mothers, almost all of your bacteria were picked up from the environment. This difference is a big one. Aphids pass down their symbionts like they pass down their genes. This means, for one, that there is inheritance, one of the necessary conditions for natural selection. If one aphid does better than others because of a variation within its bacteria, and those bacteria are passed down from generation to generation, then that symbiotic collective of aphid and bacteria will meet the requirements for being an evolutionary individual. In Hull’s terms, together they make up a unit of selection. There’s an entirely new thing where before there were two. That’s not the case for you, nor is it the case for most of your microbes – so through the eyes of evolution, you’re separate individuals. True, we don’t inherit our microbiome, the way aphids inherit their Buchnera. From the point of view of evolution, we’re separate creatures. But recall Digby and Spencer’s talk of functional interdependence and integration as the criteria that bind together an organism. What makes something a genuine whole rather than a mere collection of parts turns on both the degree to which each part depends on the others for its operation or existence, and the degree to which the maintenance, behaviours and responses of the whole are a result of the structure and interplay of its parts. If the make-up or functioning of a system depends on one part, in these ways, then that part belongs to the whole, regardless of how it got there or whether it’s passed on. If we want to understand the human metabolism and how it works, or how the immune system develops in a single individual, or how organisms take in energy and maintain themselves – then it seems clear we need to include at least some of our most vital microbes. Through the lens of physiological individuality, in which discrete parts function as an integrated whole, you’re an individual who contains human parts and microbial parts.